Trappro humanely removes flying squirrels squirrels that have gained access to your attic, walls, shed or other areas of your home. Flying squirrels will be trapped and removed. Flying squirrel nests, droppings and other messes made by flying squirrels will be safely removed from walls, attics, sheds etc. Dead flying squirrels or baby flying squirrels will also be carefully removed if found in your home in Maryland, Washington DC or Northern Virginia. If you hear sounds in the walls of your home, noises in the attic or see squirrels on your roof call us today. Description: Flying squirrels are typically confused with young gray squirrels. Both species will be searching for a safe, warm, and dry place to nest. Both will chew through wires, roofing, and soffit to provide entry. Both will cause similar damage making it difficult to decipher your exact issue without the help of a licensed wildlife technician. Flying squirrels are nocturnal animals equipped with 2 arms, 2 legs, large dark eyes, a flattened tail, and very distinct furry flap membrane that stretched from their feet to their arms (known as the patagium). They vary in color dependent on their species. The 2 species found in North America are the Northern and Southern flyers. Northern adults are larger in size, typically between 10 and 12", with fur that appears more reddish-brown or blackish brown with a dark gray belly. Southern flyers tend to run slightly smaller, approximately 8 to 10", and with fur that is more so gray and a belly that is white. DNA is truly the only way to tell for sure. Luckily, the species are not known to interbreed. Despite their name, flying squirrels do not actually fly. They use the patagium to glide anywhere from 80 to 150 feet while using their flattened tail as a stabilizer and a braking aid. The patagium does not allow for long distance flight. It more so enables a parachute-like ability. They are colonizing animals by nature. Typically, anywhere from 10 to more than 30 are present in any one area together. Food Sources: Flying squirrels are omnivorous and will eat almost anything that they can find. They will dine on fruits, nuts, acorns, insects, flower buds, other vegetation, and even bird eggs. Flying squirrels are known for hoarding and storing food, usually acorns, mainly for survival during the winter months. They can store up to 15,000 nuts in a season. Life-Span & Reproduction: The mating season for flyers begins in February and continues through the month of March. After a gestation period of about 40 days, a litter of up to 7 young are born without any capabilities of their own. The young are born in a nest; at first appearing naked and helpless. Their internal organs are visible through the skin. They are cared for by their mother as the males do not participate in nurturing the offspring at all. By 5 weeks old, they are almost fully developed and are able to practice gliding skills. They will continue to practice hopping and gliding during the first few months of life until they are successful. Their skills are perfected after approximately 2 and ½ months and they are ready to leave the nest. Flying squirrels can live up to 6 years in the wild and up to 15 years in captivity. The mortality rate in young flying squirrels is high because of predators and diseases. Several animals serve as predators for flying squirrels, hence them being nocturnal in an effort to avoid as many as possible. Predators of flying squirrels include, but are not limited to, coyotes, raccoons, owls, coyotes, feral cats, and tree snakes. Typical Areas of Entry: Flying squirrel infestations typically occur in the attic or attic crawlspace of the home because flying squirrels prefer to be in lofty areas away from ground level. 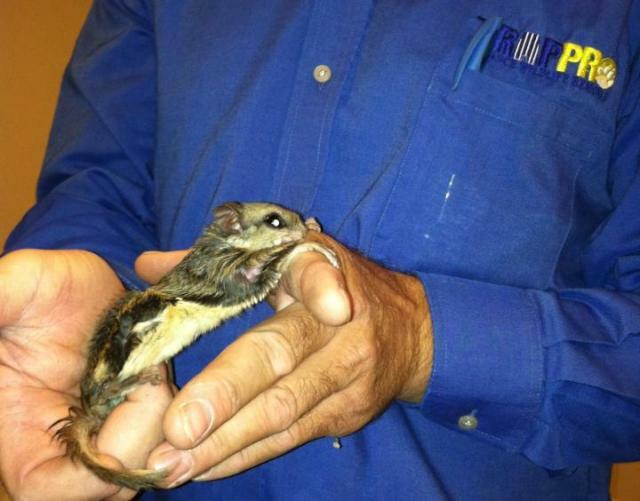 Flying squirrels are able to quickly and easily gain entry because of their size and climbing capabilities. They only need a hole the size of a quarter to gain entry. Flying squirrels are partial to entering, but are not limited to entry through: open chimney flues, open rooflines, unscreened gable vents, crawlspace vents, roof vents, bath vents, kitchen vents, dryer exhaust vents, rotten fascia or soffits, rotten wood within the roofline, and a number of other potentially open areas within the exterior of a structure. Flying squirrels will be urinating and defecating in the areas they habituate. Insulation, existing in the attic or crawlspace, will become soiled and an odor is likely to be profound due to the excrement/debris left behind. The "R" value, which dictates thermal resistance, will become declined over time as the flying squirrels disturb and tunnel through the insulation. Their continuous running and tunneling, even without debris left behind, can destroy insulation making it useless. Trappro technicians offer attic insulation/debris removal, as well as re-insulation services. Typical Treatment: Live cage trapping is not effective with flying squirrels, due to the fact that their bone compilation is mainly cartilage. They have the the ability to easily escape from cage traps due to their size and flexibility. Because of this, Trappro advises using an "exclusion" tactic to rid your home or structure of these nuisances. First, a thorough inspection by a Trappro technician will be completed. At that time, the area(s) of entry will be identified and repair/sealing recommendations will be created. These repairs/sealing with have to be made in direct conjunction with the installation of an "exclusion trap". Exclusion traps are one-way doors which allow smaller wildlife (unable to be caught in a live trap) to escape an enclosed area without allowing re-entry. In order to assure no re-entry, all existing openings will need to be permanently sealed immediately before the one-way door is installed. By closing off all existing entry points, and installing a fabricated exit, the flying squirrels will be limited to one way out with no way back inside of the structure. Because flyers have a natural instinct to hoard food and can hoard a month or more supply easily, Trappro recommends leaving the exclusion trap on the home or structure for approximately 2 to 4 weeks. Doing so assures that all flying squirrels have made a successful escape. Dangers: Chewing is a dangerous tactic flying squirrels are equipped with. Not only will chewing allow them entry in to the structure, but their preference to chew on electric and utility wires poses quite the fire hazard. Flying squirrels also chew through drywall, wood, and all other types of materials. Though rabies is not commonly reported in flying squirrels, they carry ectoparasites (fleas, ticks, bed bugs, lice) that are easily transferred to other surfaces, pets, and humans. They also can carry typhus, which is extremely rarely passed to humans. Our professional trappers will also be able to seal up holes in attic or walls including fireplaces and vents where flying squirrels have entered the home. Trapping and exclusion of flying squirrels is available for homeowners and business owners throughout Maryland, Washington DC and Northern Virginia. Call Trappro TODAY! Have your flying squirrel intrusion on the road to resolution!